Hello! Nordstrom Scent Event 2019 has begun April 2019! Checkout the new Nordstrom Sample Bag 11pc with $85 and Bloomingdale’s F&F Event take $15 off every $150 you spend! Plus, a few beauty gift with purchase offers and Estee Lauder limited edition set! NORDSTROM (NEW) GIFT 1: Choose a Free 11pc Gift with Your $85 Women’s or Men’s Fragrance Purchase enter PINK or YELLOW at checkout. This post may contain affiliate links. Read the full disclosure. Ladies, it’s Lancome Spring Gift with Purchase at Nordstrom, March 2019 only! Customize your 7pc gift worth $142 free with $39.50. It’s spring beauty event at Bloomingdale’s and Von Maur. Check out the beautiful 16-piece gift bag with $150 purchase at Bloomingdale’s + spring GWP from Lancome and more. Also, score 6-piece Darphin deluxe gift with $125 sitewide purchase from Bluemercury! Plus, new beauty offers at Neiman Marcus, Belk and Target. NORDSTROM (NEW) GIFT 1: Choose a Free Gift (a $142 Value) with Your $39.50 Lancome Purchase. This post may contain affiliate links. Read the full disclosure. Bloomingdale’s fans, I’ve found this rare 13 free mystery samples with any $125 beauty purchase! Plus, new beauty gift with purchase offers from Ulta, Skinstore x Erno Laszlo beauty box + free beauty bag and Macy’s Holiday Limited Edition beauty boxes sale. Bloomingdales (NEW)(HOT) Receive a 13-piece mystery gift with any $125 beauty purchase. This post may contain affiliate links. Read the full disclosure. Five hot beauty gift with purchase offers are at Bloomingdale’s, Belk, Walgreens, Anthropologie and Clarins! Bloomingdales (NEW) Through 12/9, take $20 Off Every $150 You Spend on Almost All Beauty Purchases. (NEW) GIFT 1: Receive samples of Crème de la Mer The Eye Concentrate Daily 0.10 oz. and Crème de la Mer 0.5 oz. with any $250 La Mer purchase. This post may contain affiliate links. Read the full disclosure. Lancome GWP March 2018 has begun at Bloomingdale’s and Lancome. Customize free Lancome gift with any $39.50 purchase + step up gifts. Also, I have a sneak peek of Lancome Spring Gift with Purchase at Nordstrom. Plus, a few new beauty deals today. Lancome (NEW)(HOT) offers up to 8 free deluxe samples with combined coupons. (NEW) GIFT 1: Enjoy 4 skincare samples and 4 makeup samples on orders of $75 or more. Combine codes MAKEUP and SKINCARE at checkout. Valid 3/15-3/16. Combined with the next coupon. This post may contain affiliate links. Read the full disclosure. *HOT* Clinique Bonus 7-piece Samplers with $28 Purchase at Bloomingdales and Ulta 28-piece beauty bag for Platinum! It’s Clinique bonus time 2018 at Bloomingdales (plus $15 off), Belk and Bonton. Plus, new Platinum beauty bag with $150 purchase at Ulta. Bloomingdales (NEW)(VERY HOT) Receive a seven-piece gift- featuring your choice of Marimekko cosmetics bag, lip color and more- with any $28 Clinique purchase at Bloomingdales.com (a $75 value). PLUS, take $15 off every $75 spent in Clinique. Offer valid through Feb 6. This post may contain affiliate links. Read the full disclosure. The huge discount and free gifts on fancy beauty brands sold at Space NK, Nordstrom, Sephora and Bloomingdale’s are almost too good to believe! I wanted to share new gift with purchase from Clinique (+ Clinique bonus), Elizabeth Arden, Estee Lauder at Nordstrom (plus two gift bags), Dior gift with purchase with $25 order at Bloomingdale’s, very rare $5 off for N.Dulge members at Space NK + new items 75% off and new Clinique 3-step gift at Sephora. Space NK US (NEW)(Today only) Check your inbox for $5 off any purchase. This post may contain affiliate links. Read the full disclosure. Big 2, Bloomindale’s has a new 20-piece mystery bag with $100 purchase + Clinique GWP + Lancome GWP + more. 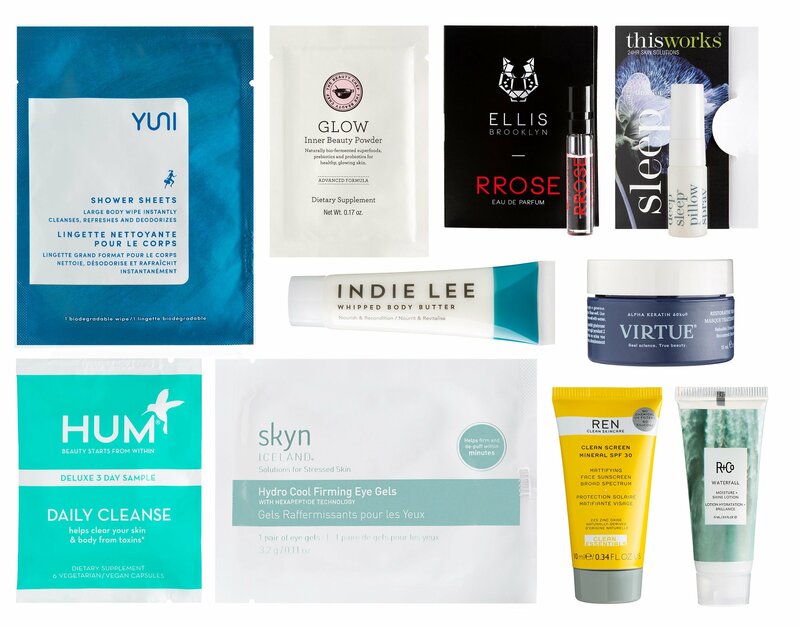 Adore Beauty Australia has two new beauty goodie bags free with any $100 purchase. Plus, new beauty offers at Ulta and Bareminerals. Bloomingdales (NEW)(HOT)(RARE) Receive a mystery gift of 20 samples with any $100 beauty purchase. (NEW) Choose one sample for every $25 you spend in our Glowhaus boutique at Bloomingdales.com! That’s 4 samples with a $100 purchase. Gift automatically added at checkout. This post may contain affiliate links. Read the full disclosure. Estee Lauder gift with purchase at Bloomingdale’s has begun – 9 deluxe samples with $35 Estee Lauder purchase or score 15 freebies with your $52 Estee Lauder fragrance purchase. Plus, there are nice offers from Sephora and Bluemercury. Bloomingdales (NEW) GIFT 1: Receive a 7-piece gift with any $35 Estée Lauder purchase. Choose one of the following gifts: This post may contain affiliate links. Read the full disclosure. Last minute beauty deals at Bloomingdale’s are tempting — 18-piece beauty bag with $150 beauty purchase, extra gift with $100 fragrance purchase, up to $50 off SpaceNK purchase and more! Nordstrom just dropped MAC x Patrickstarr collection and the 51-piece GWP is still available. Also, there are so many awesome gift cards deals at Amazon, including Wholefoods of course 🙂 Bloomingdales(NEW) GIFT 1: Receive a black quilted tote bag featuring a lip-print lining including 17 deluxe samples with any $150 beauty purchase. Combined with GIFT 2. This post may contain affiliate links. Read the full disclosure.